From setting up your terrace garden to helping you maintain it on your own, this company helps you bring to life the garden of your dreams. It’s like Peter Pan’s Neverland, when they’re done! Founded in 2012, My Dream Garden is a company that will help you bring to life the garden of your dreams. If you’re plant related knowledge knows certain boundaries and your fingers aren’t green enough, they will be the green fingers for your garden. They believe that growing a garden is a pleasurable exercise and apparently sustains good mental health. From garden packages to gardening equipment, they have a variety of products and services to offer for your garden. 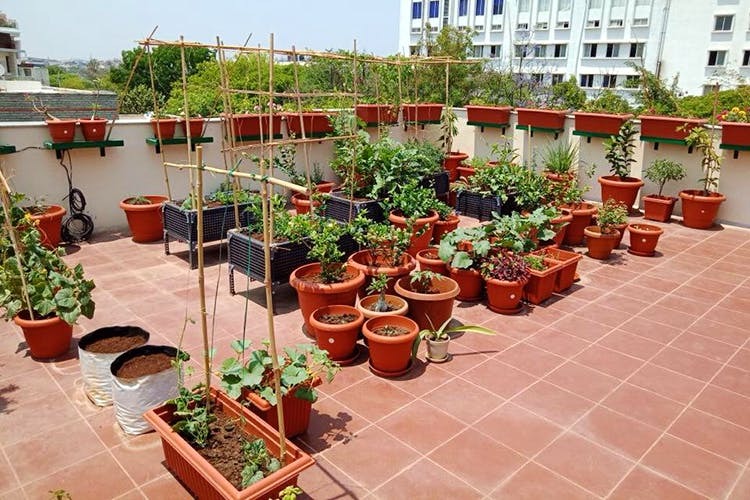 The terrace and balcony garden packages are to set up a garden from scratch at your home or office and start at INR 4,700 for a balcony package. A trained executive will be sent to your place to check out the space, the sunlight availability and suggest suitable plants accordingly (a green house set up could also be done). They specialise in something called a potting mix that needs to be mixed with soil to add the necessary nutrients and minerals for the growth of the plant. They also have a compost kit for INR 2400 which is a large pot with three layers where you put in your organic waste from home and convert it into home made compost in about 2 months, free of chemicals. The shop also has a nursery on the terrace where you could buy saplings starting from INR 10, seeds, vegetable garden supplements and larger plants too. Apart from this, they also sell pots, planter boxes, fertilisers, vermi-compost, insecticides, tools and equipments to maintain the garden you have worked so hard for. You could call them for regular garden maintenance, or for gardening tips. They also offer training and set up workshops and social awareness programs to help make each house eco-friendly and pretty too.